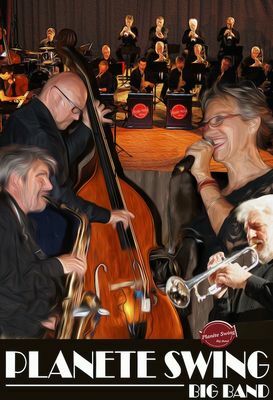 JAZZ CONCERT e Planet Swing Big Band is a great swing band that occurs throughout the region. it respects the traditional form of "big bands" with a brass section gathering saxophones, trumpets and trombones and a complete rhythm (bass, drums, piano and guitar). The various pieces performed, some of which will be sung, will cover the different streams of jazz. A beautiful show in perspective!